This evening (Tuesday 15th 2013), Facebook had an unexpected press event inviting journalists to "come see what we're building". There was speculation about a revamp to Timeline, and even a Facebook phone. Instead, Facebook announced their "third pillar". Mark Zuckerberg took the stage at 1800 GMT to explain about Facebook's three pillars. The first is the News Feed, which tells us what everyone's been doing lately. The second is Timeline, which lets us focus in on one person and find out more about their life. The third, and new, pillar is "Graph Search", which is exactly what it sounds like. For years (since its inception really), Facebook has accumulated loads of data on all of us. 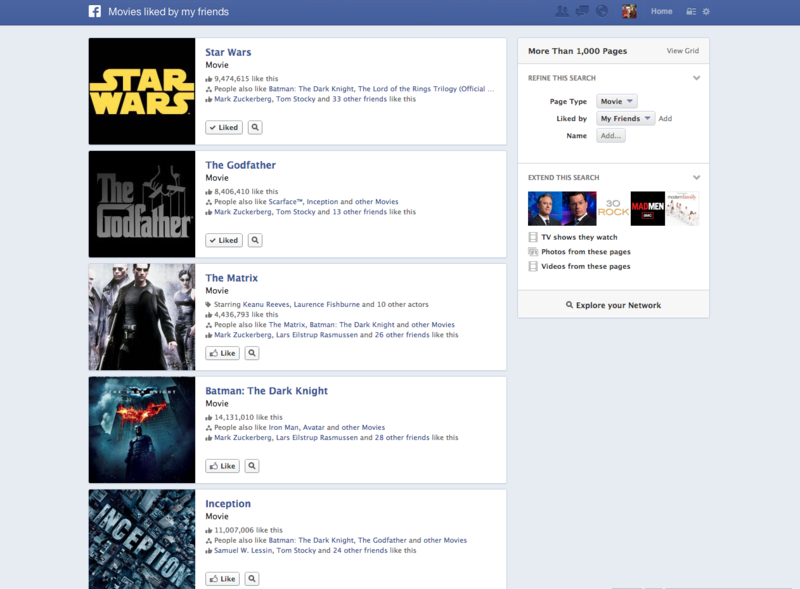 We tell Facebook our relationships status, the languages we speak and the films we like. Up until now, those things have just been statistics on profile page, unexplorable. Graph Search allows for natural language queries. That is, you can ask it to find "My friends who like Game of Thrones", and it'll do just that. It extends across most of the network, primarily incorporating likes, places and people. Ultimately, you can search for "My friends in Edinburgh who like Lord of the Rings and are students" to organise the ultimate viewing party. As well as finding your friends, you'll be able to explore the graph at different levels. 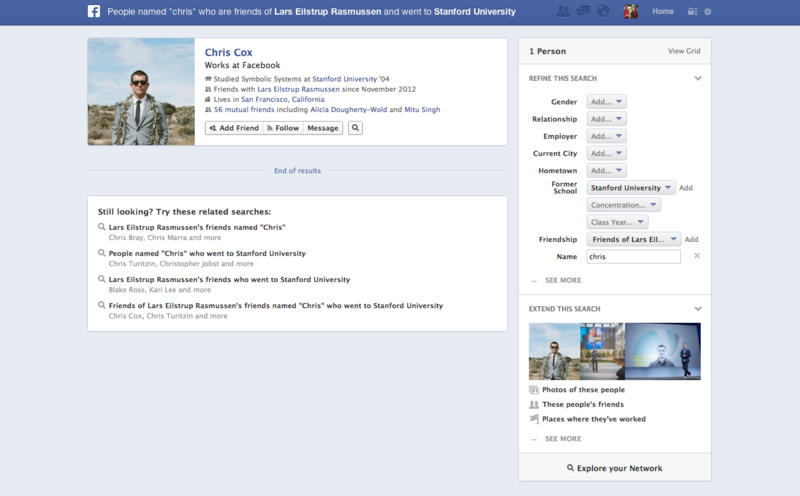 For example, if you were at a friends birthday and met someone called Chris who went to Stanford, you could search Facebook for "People named Chris who are friends of Lars and went to Stanford University". No longer should hazy memories from nights out limit you keeping in touch with the people you met! Higher up the social graph, you can find "Bars in Dublin liked by people who live in Dublin" with aggregated results to find you the best bars in the Irish capital, according to locals. One example Facebook demonstrated at their event too was "Music liked by people who like Mitt Romney" which, if nothing else, will be very interesting to statisticians. A particularly nice demonstration was "Videos by TV shows my friends like", which immediately provided an index of clips from Archer, 30 Rock and the other most popular shows amongst your community. For searches where Facebook can't help ("Weather in Edinburgh", "Bon Iver's latest album"), Bing is now nicely integrated to search the rest of the web. Says Mark Zuckerberg, "We don't think a lot of people will come to Facebook to do web searches, but if we can't find what you're looking for, it's good to have this." Predominantly, the navigation bar at the top of Facebook is changing. The focus now is absolutely on Graph Search, and as you start typing into the box Facebook will provide possible queries you might consider. On each results page is an area where you can "refine your search" to non-verbally change what you're looking for. It also provides some suggestions of more detailed searches you might perform. Now you can quickly access your privacy options from any Facebook page. As with every product Facebook releases there are questions about privacy, and there will continue to be people who don't understand but I'll point out here that privacy settings are the same as everywhere else on Facebook. If you don't let strangers see your account, they can't search for you. If you hide certain bits of data, like your relationship status, you won't show up in search results for "friends of friends who are single" or similar. In fact, Facebook noted that 10% of their worldwide computing power is put towards calculating privacy settings and determining whether a certain nugget of data should be visible to you. If you're a privacy worrier, you can use your Activity Log to check who can see certain bits of information about you. 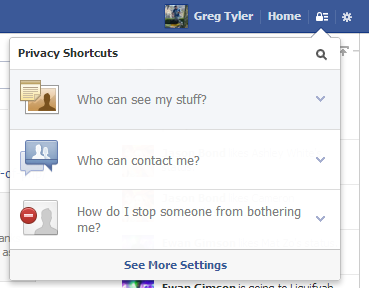 There's also a privacy shortcut button in the top right-hand corner of Facebook now. Frankly, this is what we should expect from a "social network". The ability to actually browse information socially and use it to find interesting new things, like music that our friends recommend, is the entire raison d'être for social networks. Rather than friends having to write posts saying "you should listen to this band" or "you should check out this restaurant", we can now find those things organically, when we want to know. Also, Facebook search has always been crap. Funny how they flipped that round. Want to know more? Sign up for the beta? You can sign up for the beta now. Meanwhile, global releases over the next "weeks or months" for everyone else.